Pina was signed by the Fargo-Moorhead RedHawks on April 13, 2018. 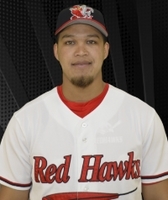 Pina, 23, joins the RedHawks after spending seven years in the St. Louis Cardinals organization. He signed as an undrafted free agent in 2011 and played two seasons in the Dominican Summer League before coming to the U.S.
Last season, Pina split time between High-A and AA, where he hit a combined .261 with 37 RBIs and five home runs in 103 games.